Summer is nearly upon us! We've got about three full weeks of teaching left until it's time hit the snooze button in the morning and hit the pool in the afternoon. The perfect summer outfit is never complete with out some great summer shoes! 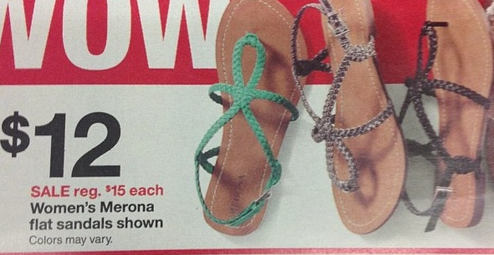 Right now both Target and DSW are offering some cool savings on summer footwear. DSW is also doing some summer promotions on shoes. Right now on their website, DSW.com, they are offering $5 off one pair, $10 off two pairs, and $20 dollars of three pairs of shoes. No coupon necessary! Also, if you are a rewards member, starting May 9th, you can get the Sunfest pool bag (seen above) for free with a $29 dollar purchase at any DSW store! Shoe string lesson: Keeping up with the trends can be costly, but if you read some of the blogs and check your favorite stores coupons both in the mail and online -- you can keep up with the trends in frugal fashion! Anyone else know of some killer shoe deals for summer? Summer collections of shoes and other important things on these important shoes are really nice for all the people. The people buy essays and articles for all of us and we can learn great articles for on the summer collections.